Lizzie the quilter: Friday night sew in. Last night was very productive for me, I made 2 Round and Round blocks, they are so much fun to put together. The pattern is by Thimbleblossoms and I used lots of Bonnie and Camille fabrics and a few other favourites. I have made 5 blocks now only 2 to go, Can't wait to get this one finished. To finish the night off and relax a little before bed I basted some hexagons for a new design, I love this fabric. Its so pretty and girly. Do you ever have days where you plan to do so much but you feel like you haven't achieved anything. I had a day like that today. 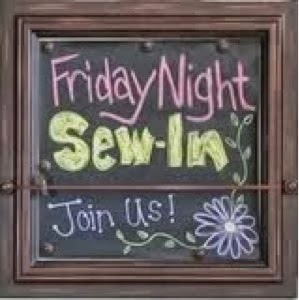 What did everyone else who joined Friday night sew in get up to? click here to go and see. Love those quilt blocks and hexie prep is very relaxing. Your Round and Round is looking great. The hexies are cute. Lovely blocks, I agree Hexies are relaxing. Your quilt is coming along nicely, Leanne. Your Round and Round blocks are fantastic. My whole week has felt like I did not finish anything! I love the circles of friendship stars! That makes a lovely quilt. And, yes, days where nothing seems to get accomplished…tell me about that! Where does the time go? Christmas gifts made by me.